There's a ten foot tall head of a dachshund dog wearing a chef's hat and bow-tie sitting on a post at the intersection of Sloat Boulevard and 45th Avenue in San Francisco. The bow-tie is polka dotted and the hat has the initials "DD". It has been there since January 27th, 2005, is maintained by the city, and since 2006 has been designated San Francisco Landmark Number 254. Before that, it was down the street about a block at 46th Avenue at 2750 Sloat Boulevard, standing outside a hamburger / hot dog place called the Carousel Diner. But before the building became the Carousel Diner, it was known as the Doggie Diner, and was one of thirty in the Bay Area. Doggie Diner started in 1948 in Oakland as a fast food restaurant serving primarily hot dogs and hamburgers. It was located at 19th Street and San Pablo Avenue in Oakland, California and owned by Al Ross. Al Ross was a former amateur boxer from the Bronx in New York. One of the first post World War II fast food restaurants, the Doggie Diner restaurant soon expanded into thirty more locations spread throughout the Bay Area. Each location was graced by a giant ten foot tall, about four hundred pound, almost six foot in diameter, rotating dachshund head which had been designed by Harold Bachman in 1965. The heads were fabricated by International Fiberglass down in Venice, California. International Fiberglass is more well known for their creation of Muffler Men. Doggie Diner had a fantastic run until around 1979 when with sales down due to competing with other fast food places like McDonald's and Burger King, Al Ross sold the Doggie Diner chain. The last of the diners closed in 1986. Al Ross died at the age of 93 in March 2010. This sign stood outside the last operating Doggie Diner restaurant (later, "Carousel") on the N.E. corner of 46th Ave. and Sloat Blvd. Designed in 1966 by graphic artist Harold Bachman (1921-2005) for the popular unionized Bay Area drive-in chain, the Doggie's whimsical style (shades of swing and early auto age cartoons) has delighted generations of visitors to Ocean Beach. A massive grassroots preservation effort, chronicled nationally in the "Zippy the Pinhead" comic strip, led to its acquisition by the City of San Francisco (Dec. 2000). Toppled by wind April 1, 2001, it was restored by the Department of Public Works, returned to its post by Independence Day, and relocated to this median in January, 2005. The location of the Carousel Diner was demolished in 2011 by the Sloat Garden Center to make room to expand their outdoor sales area. A few additional Doggie Diner heads still exist. One resides at Streetlight Records in San Jose at 980 South Bascom Avenue. It's believed that the head in the store may have originated from a Doggie Diner in Fremont. It is now surrounded by lights and collectibles. Another one is up in Boonville off Highway 128 at a place run by Sheep Dung Properties called The Other Place. They also use a picture of the dog head on their gift certificates. This specific head may have originated from a restaurant in Santa Rosa. A third head is outside the tasting room of Vino Noceto Winery in Plymouth, CA. It is believed that the head came from a restaurant in Emeryville. The owners of the winery won it in an auction back in 1985 for their children's nursery school. It cost them $300 in a silent auction. Special thanks to Vino Noceto for the two pictures of their head below. Bruce Kennedy of Bell Plastics in Hayward collects fiberglass structures. 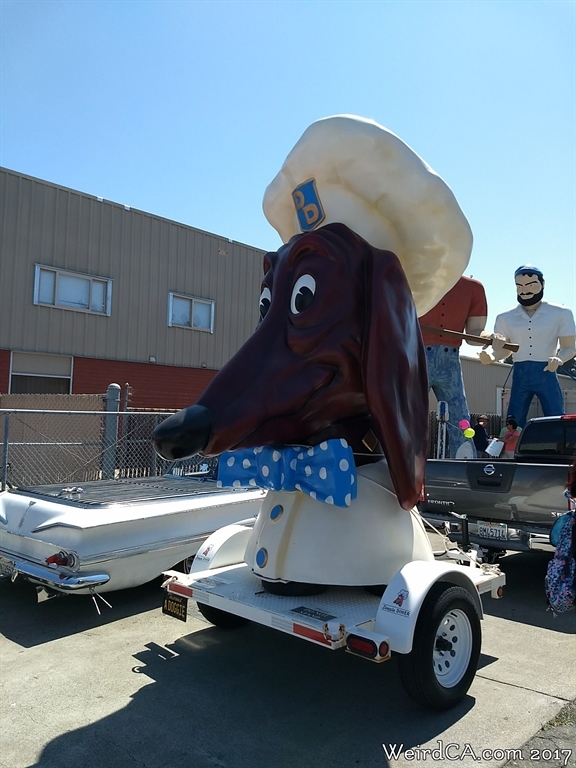 He was already in possession of four Muffler Men as well as other fiberglass giants, before he acquired his first Doggie Diner Head in the first quarter of 2015. 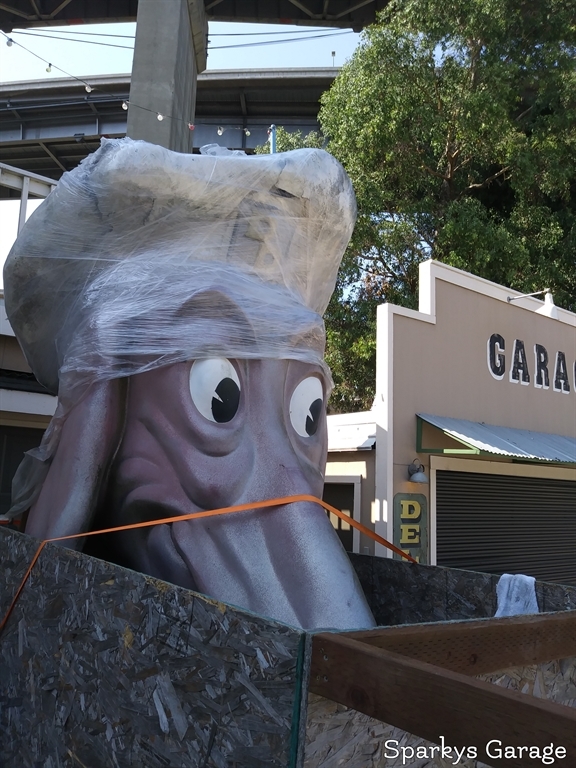 The Doggie Diner head had been residing in storage south of Sacramento. Bruce also acquired the rotating mechanism that formerly allowed the head to rotate 360 degrees. Bruce has had both Doggie Diner heads repainted and repaired. The paint job does look beautiful on each of them. One was installed on September 21st, 2016 to the right of the Cowboy Muffler Man complete with his rotating mechanism so that he can now rotate when Bruce wishes to turn him on. The day we visited, the wind had blown the Doggie to one side, causing it to partially rotate towards the Muffler Man. For more info on Bell Plastics, Bruce Kennedy, and his fiber glass giants, see the entry on Bell Plastics. There is also a Doggie Diner Head on Harper Street in Berkeley sitting in a private residence's driveway. The house has several other pieces of dachshund artwork outside and locals have given it the colorful moniker of the Dachshund House. 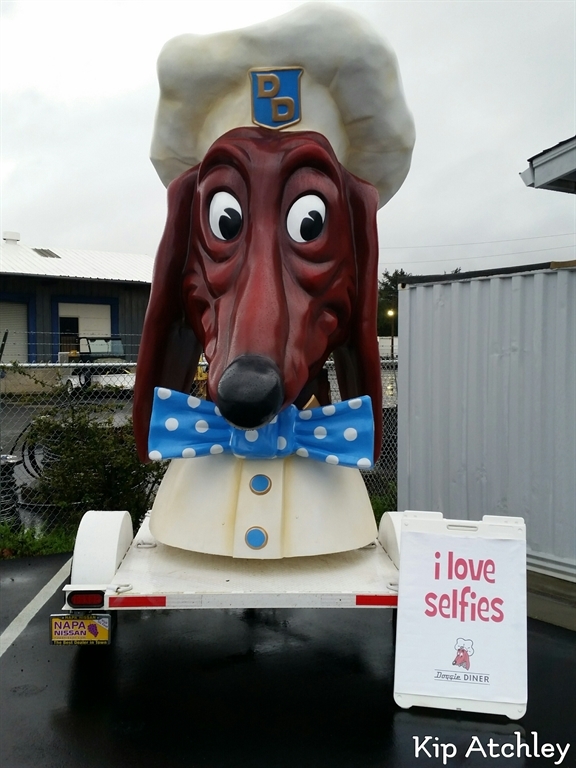 The owner of the Doggie Diner Head is Eni Green, a self proclaimed "Doxieholic" who collects dachshund related art ranging from signs to sculptures to paintings to apparently Doggie Diner Heads. You need to walk through a Dachshund archway just to get to her front door. One of the sculptures in her front yard is from Patrick Amiot of Sebastopol. Amiot has many many sculptures gracing people's yards in the town of Sebastopol. The theme of dachshund artwork continues inside the house, and Green even owns a few live and breathing dachshunds. She, additionally acquired a Doggie Diner head from a garage sale. He wears a yellow shirt and sports a green with yellow polka dots bow-tie. He stays in Eni Green's driveway and can be seen by looking over the dachshund themed gate. Regrettably Green was not home when we stopped by, although her dogs were as they barked in response to my ringing of the doorbell, so I was unable to get better pictures. John Law owns three different Doggie Diner heads, affectionately named Manny, Moe, and Jack. He has them in a trailer and drives them around the Bay Area to a variety of different events ranging from music shows to parades to artistic, charity, civic and even community events. They also made a cross country trip, as John drove them all the way from San Francisco to New York City. John rescued the three heads around 1990 and has been driving them around the Bay Area ever since. They were last known to be parked on Treasure Island on Avenue H between 11th and 9th streets, but I believe they have been relocated somewhere else within San Francisco (if you know where, please let us know). A few years back, John ran a successful Kickstarter campaign and raised thousands of dollars in order to restore the three heads. (Kickstarter is a crowd sourcing website). All three heads have received a brand new beautiful paint job! 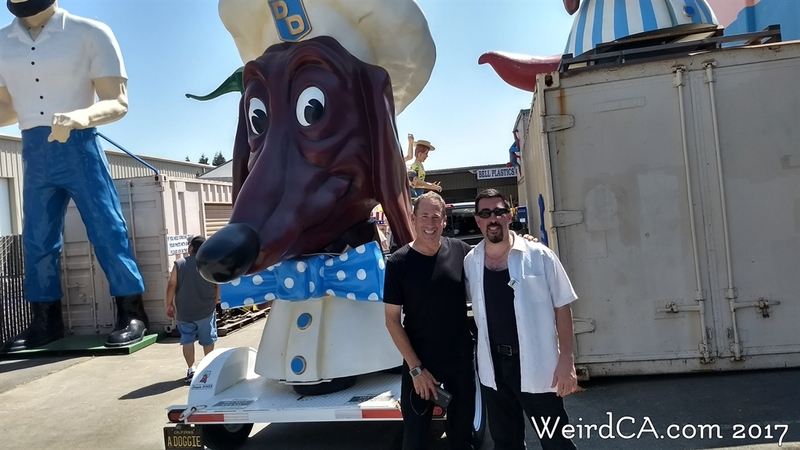 With Kip Atchley (on left) and his Napa Doggie Diner Head! There is another Doggie Diner head hiding currently in Napa. It's owned by Kip Atchley. Kip discovered the Doggie Diner head in an old warehouse in Vallejo. 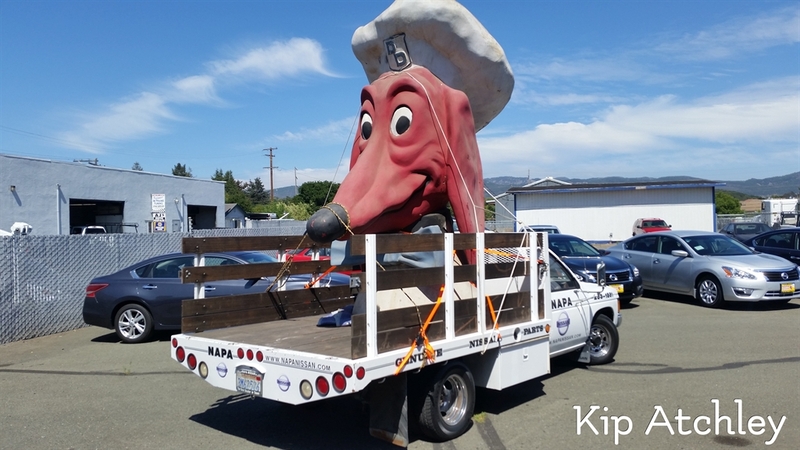 The dog head has been restored and Kip, along with some partners, plan to one day bring the Doggie Diner restaurant back starting in Napa! Sadly the costs might be prohibitive, but they are looking into options. Meanwhile Kip sent us several pictures of the Doggie, including both some when the head was found in the warehouse and some of it post restoration. I had the pleasure of meeting with Kip and seeing his Doggie Diner head first hand! The intention is to set up a new restaurant complete with an original Doggie Diner head in Napa Valley. Kip, along with two partners, hope to recreate the original restaurant as much as possible, and have been going out of their way to find original signage and memorabilia from the old restaurants. Kip is extremely passionate about the project and I truly hope that one day I'll be able to dine at an official Doggie Diner restaurant! The Doggie Diner head rides along on a trailer sporting the license plate "A DOGGIE". Doggie Diner stickers are over each wheel. Kip often puts out a "I Love Selfies" sign with the Doggie. For more information check out the Doggie Diner Napa Valley webpage. In 2017, another Doggie Diner Head was brought to our attention. 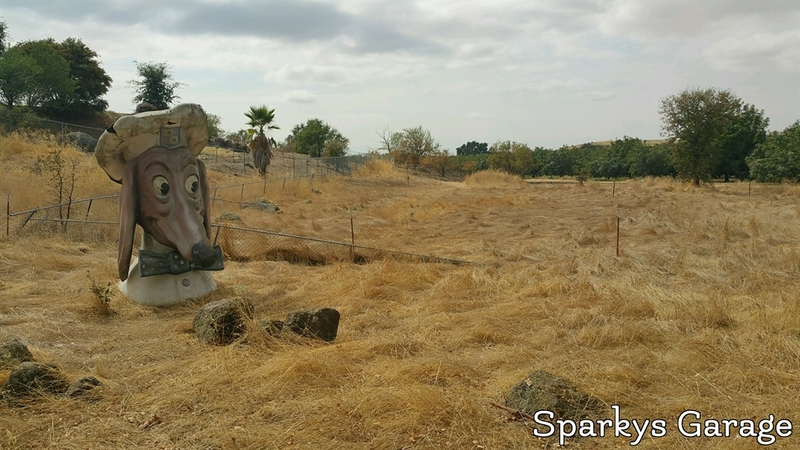 Found by Ron McKeever of Sparky's Garage, the Doggie Diner Head was found in an orchard in Butte County, and had been there since the early 1980's! The owner was the daughter in law of someone who originally worked for the Doggie Diner chain. Ron plans on performing some repairs on the poor neglected Doggie, and once that's done, put it on display at his store, Port Costa Mercantile. 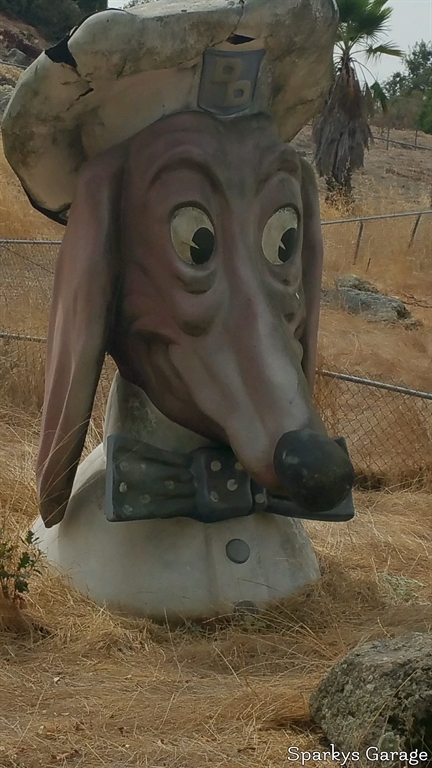 So it turns out that Hayward's original Doggie Diner head from their old restaurant is still around, just not in very good condition. This story came to us from Bruce Kennedy of Bell Plastics who owns two Doggie Diner heads himself. When the original Hayward diner closed down, the Hell's Angels who spent time at a local bar next door were enraged, and took their anger out on the dog mascot, stealing it, moving it elsewhere and then using it for target practice. Supposedly they even used a machine gun on it. One of the gang members salvaged the poor dog, and has been keeping him. 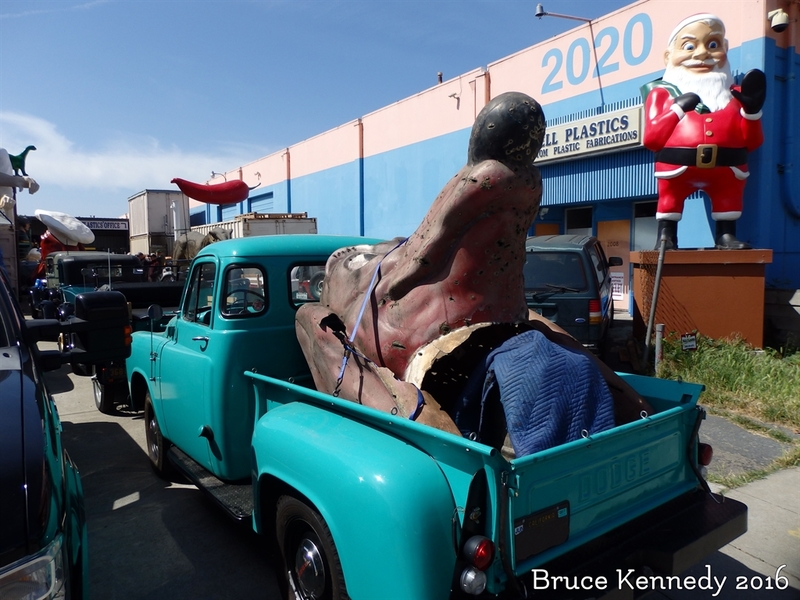 Well in the first half of 2016, the current owner loaded the dog up in his vintage pick up truck and took it to go and visit its two brothers at Bell Plastics in Hayward. In 2017, I had the pleasure of seeing him first hand, when he was again visiting Bell Plastics. Maybe one day this dog will be restored as well! In the Mission District of San Francisco, down on Capp Street, on the wall of an auto body shop, is an interesting mural with the face of Doggie Diner Head. Called Doggie Diner Sphinx the mural shows a sphinx like Egyptian pyramid with the face of a Doggie Diner Head. Painted by artist, Steve Bauer, the artwork went up in the summer of 2015. He has also done other nearby artwork such as the bee and honeycomb piece to the right of Doggie Diner Sphinx. Bauer works out of the building that the bee and honeycomb art piece resides upon and the owners of the building next to him asked him to put a mural on their wall as well. According to Bauer when he moved into his building in 1986, the building that now contains the auto shop was condemned and had a court yard. A court yard that for some reason had a Doggie Diner Head. So when he was asked to paint the wall of the building he decided to incorporate Doggie Diner into it. 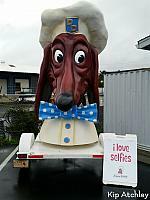 Hayward - there are two Doggie Diner Heads here at Bells Plastics, with four Muffler Men and another fiberglass giant. Bay Area - somewhere in the Bay Area the original Hayward Doggie Diner head still resides. It's in terrible condition from having been shot at. There were originally somewhere between 25 and 32 Doggie Diner heads, and these are possibly the last thirteen available for the public to see. Two other heads are suspected of making it out of the state as one might be in Stagecoach, Nevada and a few years back one was reportedly sighted in Maui, Hawaii, although if you look at pictures of the one in Maui, it looks amazingly a lot like the head in Stagecoach. Rumor has it that there is one head each in private collections in Fremont and San Rafael. The Oakland Museum of California has a small replica of a Doggie Diner head located in their History Gallery. Looks to be about two feet tall. Lastly several concession stands and grill carts at AT&T Park, as well as at least one concession stand located at Pier 39, have been named Doggie Diner probably in homage of the original restaurants. At some point though, the Doggie Diner concession stand located on Pier 39 had a name change (due to trademark issues). It is now called The Dog House. I grew up in the Bay Area and my father was the man who kept the doggie diners including their heads painted for many many years !!!! Man, I loved Doggie Diner...their chili dogs were to die for. It seemed like we lived in a magical era of these freakish symbols that we took for granted and now we replace them with Condo's and square box offices. Progress? I can tell you, the good ole days were really good. Technology screwed us up, gave us more misery under Governmental scrutiny. 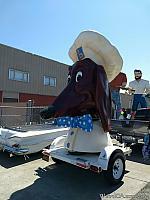 I have a 10 ft doggie diner head.it will be on display in Crockett and Port Costa Real Soon. A Doggie Diner head is on display in the Oakland Museum of California's History Gallery.